Young gamers and those young at heart Chooche brings you incredibly entertaining and ultra-addictive way to spend your time and squash a few virtual chickens in the process! 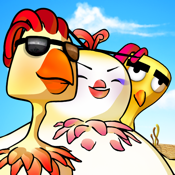 Put your skills to the test by trying to place the whole chickens flock on the road for some squashing! With simple tilt or touch controls that anyone can play and develop timing and coordination skills in the process. Each level presents more of a challenge, successful gamers are rewarded with several hidden bonus levels and bonus points. Chooche is featuring 10 exciting themes, full Retina Graphics, hidden bonus levels, Game Center leaderboards and achievements, and an original soundtrack with fun sound effects. • Hidden bonus levels during the game! We always welcome your feedback, comments, suggestions and especially your constructive criticism – they all help us to improve Chooche app. Contact us at support@meritumsoft.hr and make sure you come and visit us at https://www.facebook.com/meritumsoft. Until then, happy painting!